A dedicated Logic Pro integration is now available in ROLI Dashboard, you can now use your Songmaker Kit to access all the controls you need to create a song from scratch — all without breaking your flow. Learn more about how to access the integration here. 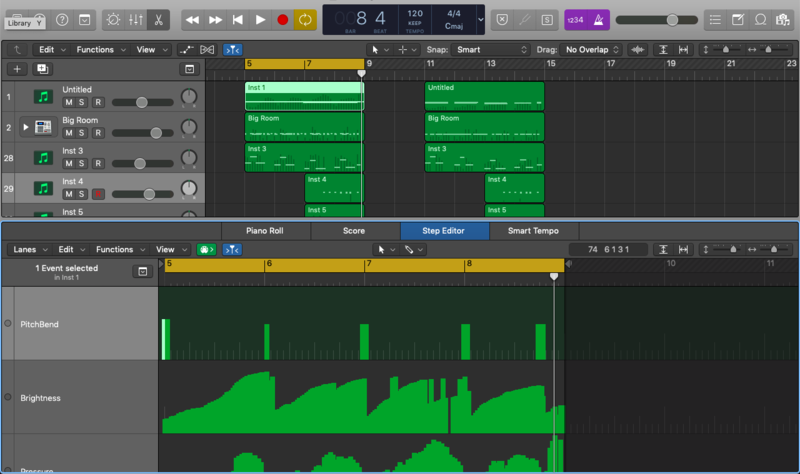 Once you have recorded your tracks in 5D using your ROLI hardware, you can edit these 5D expression data in Logic afterwards. Hit the shortcut button 'E' and then select Step Editor. You should now be able to see the elements of your track affected by 5D laid out in nine graphs, labelled Pitch Bend, Brightness, Pressure, A2, C3, B2, G2, E2 and F2. You can now manipulate these graphs to change the shape and dynamic of the sound you have recorded within that track by ‘drawing’ or clicking and dragging your mouse to move the graphs into whatever position you choose. Just don’t forget to save your changes as you make them!